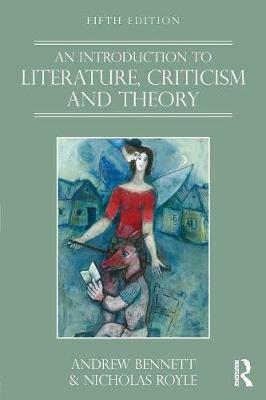 Lively, original and highly readable, An Introduction to Literature, Criticism and Theory is the essential guide to literary studies. Starting at ‘The Beginning’ and concluding with ‘The End’, chapters range from the familiar, such as ‘Character’, ‘Narrative’ and ‘The Author’, to the more unusual, such as ‘Secrets’, ‘Pleasure’ and ‘Ghosts’. Now in its fifth edition, Bennett and Royle’s classic textbook successfully illuminates complex ideas by engaging directly with literary works, so that a reading of Jane Eyre opens up ways of thinking about racial difference, for example, while Chaucer, Raymond Chandler and Monty Python are all invoked in a discussion of literature and laughter. The fifth edition has been revised throughout and includes four new chapters – ‘Feelings’, ‘Wounds’, ‘Body’ and ‘Love’ – to incorporate exciting recent developments in literary studies. In addition to further reading sections at the end of each chapter, the book contains a comprehensive bibliography and a glossary of key literary terms. A breath of fresh air in a field that can often seem dry and dauntingly theoretical, this book will open the reader’s eyes to the exhilarating possibilities of reading and studying literature.